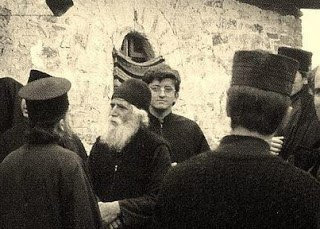 On July 12th is honored the newly-appeared star of Orthodoxy, Saint Paisios the Athonite, or "Father Paisios", as we used to call him. I have often been asked to give an opinion on Father Paisios, but I have avoided it. Not by indifference or devaluation of the person - away with the blasphemy! My hesitation is due to the fact that I do not consider myself worthy of such a thing. The Apostle Paul taught us that "he that is spiritual judges all things, yet he himself is judged of no man" (1 Cor. 2:15) (The bearer of spiritual gifts sees and understands everything, but he is not understood by anyone who is not illuminated by the Holy Spirit.) And according to Saint Makarios of Egypt: "He knows each man, from whence he speaks, and where he stands, and what measures he is in; but not a man of those that have the spirit of the world is able to know and judge him, but only he that has the like heavenly Spirit of the Godhead knows his like." However, from my meetings with the revered Ascetic I have an experience that taught me a lot. It was the summer of 1987. Together with a Greek professor from abroad and two other colleagues from Greece we visited the Elder. We also found there other visitors, mostly young people. With the appearance of Father Paisios we felt awe. Personally, seeing him for the first time and reflecting on our Christ's words regarding the Forerunner: "What did you go out into the wilderness to see? A reed swayed by the wind?" (Matt. 11:7), I felt great emotion. His little body hid such dynamism from the Holy Spirit, that it brought surprise and admiration from all his visitors. And so he was. But I received a huge lesson. Previously, someone I knew dared - on his own initiative - to ask Father Paisios about me. And he responded to him: "Papa-George is good, but very intellectual!" This was his message to me, and by the grace of God I managed to conceive it, just as it was confirmed to me by my Athonite spiritual father. And then, beyond the middle age of my life, I realized that theology is not unsupported reflection and beautiful words, but it is actions like those of the Elder. Only the Saints are true theologians, who have received the rays of the Uncreated in their hearts. Professional theologians, even without illumination, in appropriate circumstances, "theologize" based on the theology of the deified, of the Saints. True theology is not metaphysical reflection but the fruit of the Holy Spirit. This was the first great lesson I learned from the Elder from a distance. The second I received up close. Some visitors started to ask him when we will get back the City [Constantinople]. And he responded to them, according to the desire of their hearts, with some dates (2001, 2002 etc). The professor did the same; he asked about national issues. I also fell into the same trap and, when we started talking - I don't remember how - about the French, Father Paisios called them Greeks. And then I dared to talk about their arrival (Gaul/France, Battle of Thermopylae 279 B.C., their assault upon Greece, and their defeat and destruction at Kallion, on the borders between Eurytania and Aetolia, etc.). I accidentally entered a historical-academic debate. And then I remembered his old message where he called me an "intellectual". I don't know how, but I turned to my fellow visitors and said: "Brethren, we did not come here for a history lesson, but to receive the blessing of the Elder and to hear his spiritual and beneficial words." And then something happened I could not even imagine. Father Paisios stood up and bent to kiss my hand! I lost it. I did a prostration and I kissed his hand! It literally shocked me! Soon after our meeting came to an end. We took the road all together towards a monastery and I tried to explain to them what we must ask from authentic people of God, such as Father Paisios. At the monastery we met an old conversant of the Elder and I told him what took place at his cell. And he, knowing him well, with great simplicity told me: "The Elder brought it to you. He replied by telling you what you expected to hear, satisfying your nationalism, to teach you that 'you don't know what you are asking' (Matt. 20:22)!" When 2001 came and went, then I understood how he responded, as well as how the Elder taught. May we have his blessing! However, it was fascinating when his words came to our well-known theologians who had studied in Greece. Someone mentioned a name. And then the Elder said something shocking to us who were unsuspecting: "The one you mentioned is a sneaky snake." And then we left. Later, however, with developments in the Balkans, we recognized the importance and the truth of his words. Every time I visit his grave, I kneel and venerate him, asking for his blessings. And every time I have some problems, I call on his help. Saint Paisios, intercede for us!